What's happening now on the project? Road traffic and boom gates have been shifted onto the new western side of the Morphett Road bridge. Seaview Downs Primary School recently commenced a project to design the additional 50+ (360 in total) car park bays that will be provided at the project’s completion. Learn more here. Rail Safety Week raises awareness and knowledge about the potentially devastating consequences of not exercising caution or obeying the rules around railways and tram networks. See how the project team got involved. 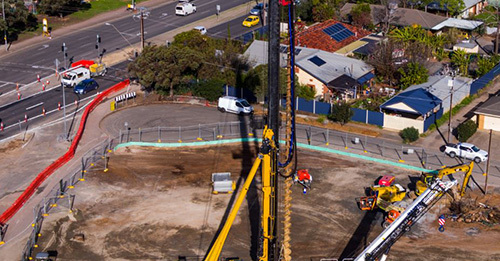 In August, the large piling rig was removed from the Oaklands Crossing project site after the team installed 141 piles 4 weeks ahead of schedule. Read more here. 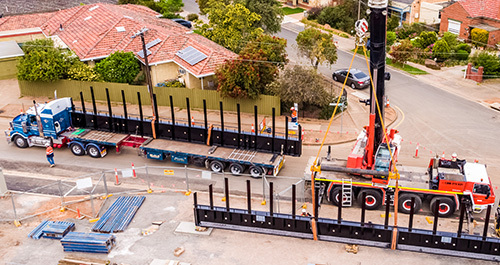 The Oaklands Crossing Grade Separation project has hit a major milestone with the delivery, lifting and installation of 9 super T beams that will support the western half of the Morphett Road bridge over the lowered rail line. Read more here. The Oaklands Crossing team has removed approximately 65% of the total amount of soil that needs to be excavated and the lowered rail corridor is starting to take shape. 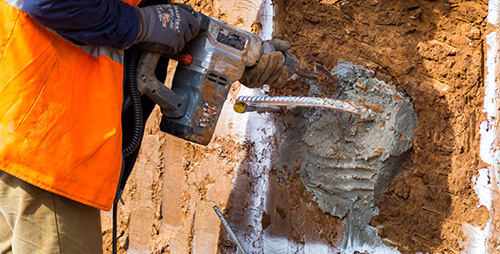 Read more about the soil nail process here. The bridge arrived at site on Monday 8 October and the project has commenced the assembling works, ready for lifting into position in early November 2018. Read more here. 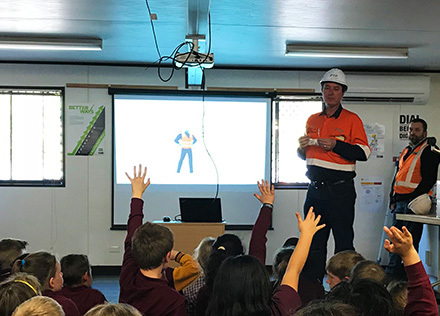 Team members of the Oaklands Crossing project visited Warradale Primary School to run interactive information sessions and nesting box construction workshops with over 100 students from years 3 to 7. See more here. The Oaklands Crossing project has been carefully designed and staged to minimise vegetation clearance. Find more information here. Upon completion of the project, more than 50 additional car parks will be provided taking the total to 360. Find more information here. How many cubic metres of soil will be excavated? How many metres of new track will be laid? How many new jobs will be created? Click here to find out. Diagonal and Morphett Roads are highly trafficked roads. The project has been carefully planned to minimise impacts on main roads and staged to allow Morphett and Diagonal roads to remain open during construction. Find more information here. The existing Oaklands Crossing imposes congestion and traffic delays on Morphett and Diagonal Roads due to the operation of boom gates for trains along the Seaford rail corridor. The boom gate operations restrict road traffic movements across the rail line for approximately 25% of the peak traffic periods. Traffic movements for the nearby Westfield Marion shopping centre, the SA Aquatic and Leisure Centre and GP Plus facilities further contribute to pressure on the road network around the level crossing. On average almost 42,000 vehicles each day use Morphett Road each day south of the Oaklands Crossing. North of the crossing an average of 33,200 vehicles use Diagonal Road and 8700 use Morphett Road. Trains have speed restrictions approaching the Station due to pedestrian and cyclist movements across the rail corridor at Diagonal Road and adjacent the rail station platform. The State Government has been working to separate road and rail at level crossings (grade separation) across the state to improve safety and reduce travel times. Grade separated road crossings at key rail locations have been identified by South Australia’s Integrated Transport and Land Use Plan. The Public Transport Projects Alliance (PTPA) has released a website, which will be the main source of information, updates and works notifications for the Oaklands Crossing Grade Separation project. The PTPA has been selected to deliver the design and construction of the Oaklands Crossing Grade Separation Project. The PTPA brings McConnell Dowell, Arup and Mott Macdonald together with the Department of Planning, Transport and Infrastructure to deliver community-based and value-for-money public transport solutions that improve liveability and connectivity for South Australians - delivered safely and with minimal disruption to local communities. On June 7, funding for the Oaklands Crossing Grade Separation was confirmed. The $174 million project is being jointly funded by the Australian Government - $95 million, the State Government - $74 million and the City of Marion - $5 million. have the potential to act as a catalyst for development and renewal in the area. Local industry participation will be a focus in line with the South Australian Industry Participation Policy, promoting the use of South Australian businesses, suppliers and workers. Steel will be purchased under the State government’s Steel Procurement Policy and South Australian products will be used wherever possible. The Oaklands Crossing Grade Separation Project is expected to create 160 jobs during construction. Early investigation works, site set up and major works commenced in the 2nd quarter of 2018, with project completion anticipated at the end of 2019. For further information or to subscribe for regular updates about the project including newsletters and works notifications, please visit the new PTP Alliance website at www.ptpa.com.au/oaklands or contact the project team on 1300 205 994. 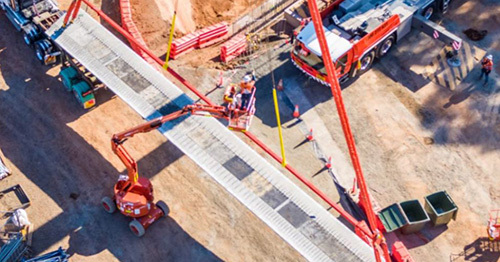 During construction, traffic on Morphett Road, Oaklands Road and other Roads will be carefully managed to minimise interruptions for motorists while ensuring the project progresses on schedule. Every effort will be made to minimise disruptions to road, rail and bus users. There will be an ongoing program of communications to keep people informed of any necessary rail services and road impacts. Advance notice of bus stop relocations or closures will be provided to bus users via signs at affected bus stops and on the Adelaide Metro website https://www.adelaidemetro.com.au/Announcements. Through the design and construction phases, DPTI and the PTP Alliance will ensure that impacts to rail infrastructure and operations are minimised. Detailed design has started, including investigations into the benefits and impacts to the local community of the various design elements and input from the local community and stakeholders, such as the City of Marion, residents, community groups and businesses. Community engagement is a key part of the Oaklands Rail Crossing Grade Separation Project and will help inform the development of the design. The design is in its early stages and a number of opportunities to get involved and provide feedback are currently being planned. A major planning study for the upgrade of Oaklands Crossing undertaken in 2012 resulted in extensive public engagement. The project did not receive any funding at the time. DPTI undertook further community engagement on the project during 2016 at Westfield Marion, including the opportunity to view concepts and provide comments and feedback. This consultation demonstrated a high level of support for the project from the community and a clear desire to get the project started as quickly as possible. In late March 2018, the Oaklands Crossing Grade Separation Project team held the first two community drop-in information sessions, at the South Australia Aquatic and Leisure Centre and the Marion Cultural Centre. Over 300 community members attended the sessions to view the current project design, ask questions and provide feedback. Focus tables around Environment, Landscaping and Urban Design, Future Access and Movement, Construction Impacts, Construction Staging and Design provided the community with the opportunity to ‘ask the experts’ and also share their local knowledge. Stakeholder engagement sessions will continue to be held throughout the delivery of the project to share information and involve the community in the design and construction phases of the project. Feedback from the sessions will be communicated to the broader project team to help inform aspects of the design and construction as the project progresses. Advance notice will be provided for all future sessions via mailed invites, emails and on the project website.